Fallout 1 is going to be a difficult game to tackle. I think I’ll write up a more conventional post, covering the basics of gameplay and avoid spoilers, like I normally do, for gamers who may still want to retro game this title. I’ll be writing a second post that dives more into the themes presented another time. From a gameplay standpoint, Fallout 1 is one of the best open-ended RPGs. The world is completely open and explorable. Your main quest is to find a water chip for your Vault. Unlike most games, there is no artificial progression through the story line. One quest does not lead to the next. There are hints scattererd around the world; completing quests sometimes reveals the next piece of the puzzle, other times it just helps or hurts the world a little. Each quest can be solved multiple ways, often with different morale dilemmas. In cities filled with the destruction and decay of a nuclear holocaust, do you uphold the morale values of yesterday, or adopt the attitude necessary to survive the wasteland? Most open-ended RPGs have an MMO feel. Fallout does not feel like a grind. The world is filled with mood and character. Each town and location feels like a a traditional linear experience: a writer filled each building with characters, each character has an outlook on life or problems and backstory. Most importantly, each action you take as a real impact on each of the cities. At the same time, however, your actions are not limited. You are not pushed down any particular path. One event does not push you into another. Like a detective, you must follow a trail of clues. Finding quests involves talking to a lot of people, and at each step you can choose to not continue down that particular path, pursue another, or get lost and unable to find the next clue. You are never left wandering for the next trigger event. There is nothing to stop you from walking right up to the final boss and killing him, except for not knowing where they are on the map. That, and you probably lack the equipment and know-how to defeat such a powerful enemy. The only limit you have is a time limit. In 150 days, the Vault will run out of water and you will lose. Otherwise, you are free to wander the wasteland. Wandering the wasteland feels a bit like Oregon Trail. You click your destination on an over-world map and watch a marker move towards it. The days tick away as you walk to your destination. At any point, you may hit a random encounter; anything from bandits or giant rats, to a crashed Nuka-Cola truck or Alien UFO. The destination you choose to go to is entirely your volition. 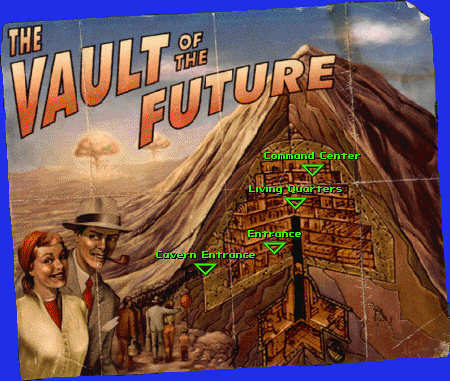 Wander the wasteland in search of random events or hop between settlements while protecting a caravan as an occupation. Once you reach your destination, you will find yourself in a town, settlement, or dungeon. Here you have a traditional isometic presentation as you walk around and talk to the inhabitants or shoot them. Either action is not limited to your destination. Feel free to talk to “monsters” in dungeons; some may respond. Also feel free to shoot helpless store owners or children; you will earn a poor reputation but have ample supplies. Combat is turn-based. It has a bit of a luck feel to it, since critical hits can instantly slay you or any of your companions. They don’t happen too often and you can save mid-combat, so it is not as much an issue as long as you save frequently. The bonus is a particularly difficult boss character that you’ve been trying to beat again and again can sometimes be taken out with a lucky critical hit; this will result in a particularly grisly death for them. Combat is visceral and brutal and still has a flair to it even with the dated graphics. Not everything has aged as well. The interface is truly difficult to use. Picking up items and following the weight limit are particularly tiresome. Misclicks reset the entire process you were following. Using inventory items requires right clicking to enter a Submenu mode, then left clicking and holding, moving down with the mouse and then releasing. Once I had to reload as a companion trapped me in a room and would not move from the doorway because the room was too small and he would not move closer until I steps far enough away. There was also a strange technical glitch from my CD based copy, even with the fan patches, that would cause the screen to turn black. Hitting F1 or ‘P’ or ‘C’ to fill the screen with Help, Pipboy, or Character sheet, would re-draw the area. As I played through the game, I grew to truly hate using the game despite that I enjoyed playing it. Overall, Fallout is a difficult game to recommend. The interface will truly stop you dead in your tracks if you are not patient or forgiving. However, if you can get past that you will find one of the most complex and compelte RPG experiences you can have. It is easily more complex (open ended without hints) and often more rewarding than anything released in the last 10 years. Many games have adopted the concepts of choice and freedom, but most present a Good or Evil path and immediately show the results of your actions. Few games have the captured the consequences and long term effects of your actions as well as Fallout 1. I hope to be able to draw comparisons to Fallout 2 and 3 once I get to play both of them. Fallout 2 offering a polished, but still retro, interface whie Fallout 3 is a reenvisioning of the series recreated by the Elder Scrolls team. You can find Fallout for same digitally from http://www.gog.com for around $6. Look forward to my 2nd part, which will *shockingly* contain major spoilers as discussion. If you don’t really plan to play the game, or have already beaten it, stay tuned. ← Six games that everyone should play, and can.